The Non woven cellulose polyester is a hydroen tangled 55% cellulose and 45% polyester non woven wiper designed for applications that require the unique combination of superior strength and exceptional sorbency. This wiper is a perfect wiping material for spill control and general purpose wiping. The cleanroom paper is specially designed for writing, printing and photo-copying in the cleanroom environment. Through polymerization process, fiber, lint and particulates and tightly bound into the sheet, and decrease electro-static buildup, which will eventually minimize scrap rate of copier. 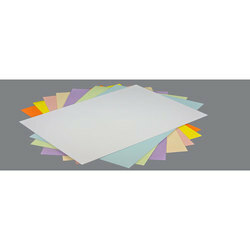 Excellent absorbent capacity, dynamic wiping efficiency, low lint, no binders or chemical additives, biodegradable. Cole-Parmer offers Clean-room Wipers, the first choice for Scientists and Professionals for maintaining critical glassware and instruments. These Cleanroom Wipes provide excellent wiping performance for heavy cleanups with low lint wiping. 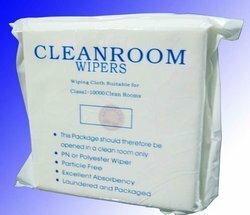 We offer Polyester Cleanroom Wiper Wipes of superior quality. These are composed of 100% polyester. The use of chemically pure material makes these wipes strong and high in absorbency. Color: White 4"*4" & 9"*9"
We are a unique entity in the industry, actively committed towards providing a qualitative range of Cleanroom Wipes. Size: 3" x 3"4" x 4" 6" x 6" 9" x 9" 12" x 12"